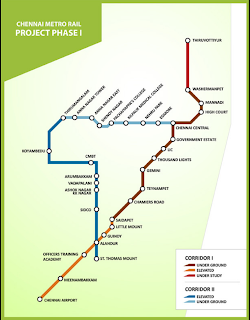 The Chennai Metro Rail is an upcoming rapid transit system in Chennai, Tamil Nadu, India. The Phase I of the project consisting of two corridors covering a length of 45.1 km is under construction. 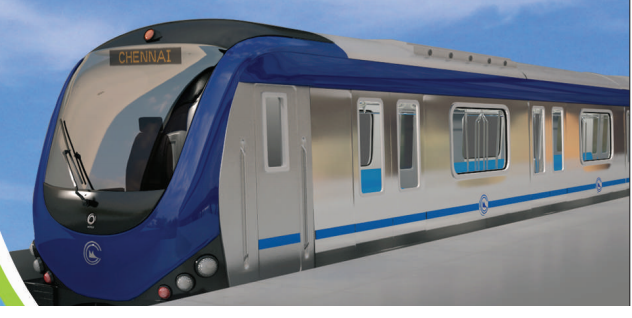 The elevated section of the project is scheduled to be operational by 2013 and the entire project is scheduled to be completed by the financial year 2014-2015. All metro stations are being constructed as disabled friendly and elderly friendly, with automatic fare collection system, automatic announcement system, electronic information display boards, escalators, lifts, and toilets. Elevated stations will have shopping malls and parking space, with additional space for future growth. Wi-Fi facility is also being planned at some of the stations. Underground stations will be air-conditioned and will have boosters to amp up cellphone signals within the premises. Washermenpet – Broadway (Prakasam Road) – Chennai Central Station – Rippon Building – along Cooum River – Government Estate – Tarapore Towers – Spencers – Gemini – Anna Salai – Saidapet – Guindy – Chennai Airport. Chennai Central – along EVR Periyar Salai – Vepery – Kilpauk Medical College – Aminjikarai – Shenoy Nagar – Annanagar East – Anna Nagar 2nd avenue – Tirumangalam – Koyambedu – CMBT – along Inner Ring Road – Vadapalani – Ashok Nagar – SIDCO – Alandur – St. Thomas Mount.